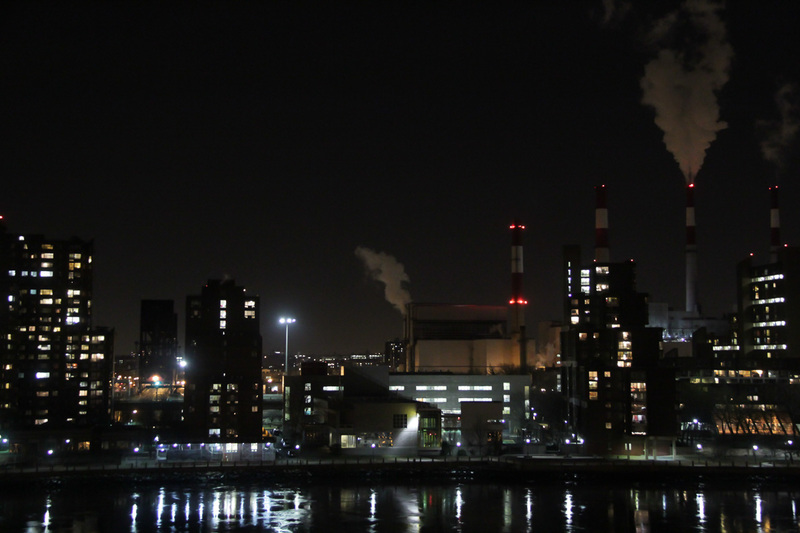 Smoking stacks in the still of a cold dark night over the East River of NYC . . . .
and not a star in sight! Thank you Margie! “Home” indeed, wherever it happens to be! Thank you so much Christine! Waiting for the Bat signal over Gotham City. Meanwhile, take a look at what Daisy Dynamite recently did to one of my earlier shots of Gotham! Those stcks are as iconic to NYC as the Empire State Building is, and I still don’t know the name of the enterprise they’re a part of or what even goes on at that plant. Those smoke stacks always feature in NYC end-of-the-world dramas! I always assumed they were Con Ed smoke stacks but it turns out they are now owned by Transcanada Corp and known as Big Allis, because they were built by the Allis-Chalmers Corp in 1965. I googled the place and it is a tangled web of deregulation and billions of $$$’s! Patti this photo reminds me of the big blackout in 2003. We were living at L.I.C. and looked back to the city and saw this view……….but with out any lights. It was amazing. Much prefer your view. What a sight, and experience, that must have been for you! Speaking of NYC summer blackouts, did you ever read “The Bronx is Burning?” A gripping read! Fantastic shot. Looks very futuristic…and ominous! Thank you Angeline, it was freezing cold and so still! Night photographs can look great in pure B+W. I like this one Patti, just the right amount of lights. Mike, thank you so much for your comment on the lights. I was so tempted to process it B & W but then I thought . . . . I can always do that later! As you so well say Antonio, a city that lives and works in one, 24/7! Warm greetings and thanks to you! This is wonderful Patti, you managed to make it look quite romantic 🙂 Did you use a tripod? Amazing isn’t it what can tug at the heartstrings! As for the tripod, guilty confession . . . . I have never used one. This might go some way in explaining my lack of discipline and impetuousness. Good shot, a bit ominous. Where are the people with so many lights on? Are they working or at home? Thank you Gerard! The people are inside, at work and home, keeping warm from the freezing cold! This was after the “polar vortex” when temperatures climbed back all the way to a balmy 29 degs thereabouts Fahrenheit! It is a balmy 39c+ here. Not a snow flake in sight. The summers here are getting hotter and stay around longer. Huge thunderstorms! I am right now going to make a rhubarb crumble. It’s the only sensible thing to do. Thank you Richard. So much! Gaynor, you would love it and hope you get to see it again! Thank you Pat, that’s Queen’s and the bright lights for you! Wonderful shot – much more interesting than the classic view of Manhattan we’ve all seen a 1000 times. I’m guessing you are back home. Great night photography Patti, very nice light reflections. OH, the smoke and reflections-stunning. Surely another world you have happened upon! All without leaving home. love this shot! Very atmospheric. Great shot – you’re back home! Showing your versatility, and love of foggy moors and inky sky-scapes. Spectacular Patti a really strong graphic photograph. Brilliant exposure, interesting in every aspect of the composition . And yet the night sky seems remarkably clear, despite the smoke. A perfect city photo … love it.